It has been such a busy week here on the blog! Inspiration every where! Our current challenge is Encouragement and I decided nothing could be more encouraging than the sweet characters in the Lil Hoot set from Hero Arts and Operation Write Home. I also really wanted to play around with some backgrounds so I decided to create some tags. Often times I feel a little overwhelmed when trying to use large backgrounds on a card. A tag is a perfect way to use a little bit of a busy background! For my first tag I smooshed distress inks onto my craft mat and sprayed it with water. I kept dipping my tag in until I like the background. after it was dry I laid down the arrow stencil and put even more distress ink on. Finally I shifted the die over to the right and used my white embossing paste. I like how just bits of the darker color are peaking out. I added a bit of stickles to the tips of the arrows. 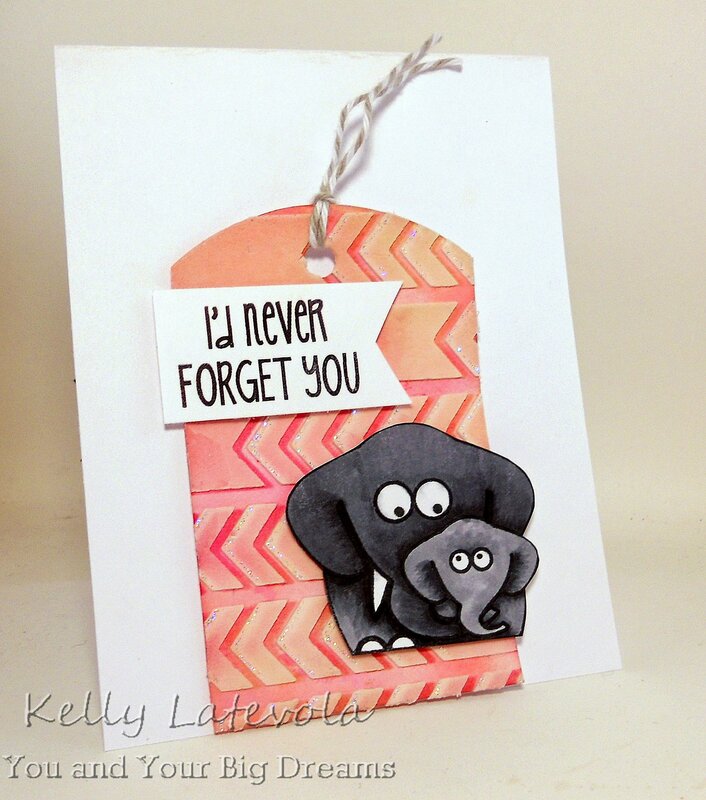 The elephant was colored with copics, fussy cut, and added with dimensional adhesive. For this background I used the Tweed stencil and more distress ink. I just kept shifting the stencil up to get the ombre chevrons. I love the blended look it gives. I flipped the stencil horizontal and added embossing paste creating a subtle cross hatch. I outlined one side of the embossing paste with stardust stickles. Again I colored the bears with copics, fussy cut, and added dimensional adhesive. This last one was the most fun to create! I love how the starry sky turned out! I added several colors of distress ink keeping it lighter where I knew my moon would be. I flicked on some water and let it dry. I added the stars using the Starry Night stencil then used a silver pen and stardust stickles to add some dots. Copics, Fussy, Dimension. All done! Categories: Handmade Cards | Tags: Arrow Pattern Stencil, Distress Ink, embossing paste, Kelly Latevola, Lil Hoot, starry night stencil, Tags, Tweed Stencil | Permalink.